James daughter, Lucy has completed her school year and is off for the Summer. She returns in September. Ann Marie remains in finals and will be ending her school year this week. Nazareth House is so very proud of both of these girls, their dedication, and determination. The both excel in their studies. Recognizing early on, the areas of talents of each daughter (Lucy & Ann Marie), James & Kadijah chose schools that specialize in their vocations. Ann Marie is studying at the International School in Freetown to be a lawyer. Ann Marie wants to be accessible to the poor who are in need of the services of an attorney. Lucy is studying to be an accountant at the Lebanese School. Both girls intend to be of service through Nazareth House to the people of their country. James & Glenda Krapf of Breeding, Kentucky and Claudio & Shelly Lopez of Bogart, Georgia through Nazareth House have provided for the girls' tuition the last few semesters. Last week, Lucy went to her school to obtain her results for the year. The fruit of your love is blooming, thank you for caring and changing one life at a time ...what a team!... what a wonderful family Nazareth House has become, thanks to you all and your compassion. 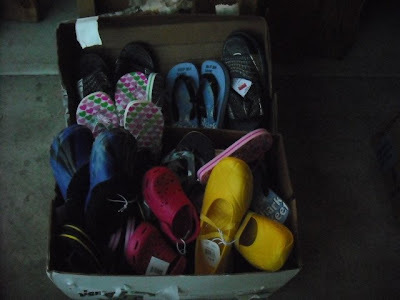 If you have sent shoes to Nazareth House/One Love Foundation in Summit Hill, PA...THANK YOU. The deadline to receive shoes is August 1, 2009. 35For I was hungry and you gave me something to eat, I was thirsty and you gave me something to drink....................DID YOU? I was a stranger and you invited me in.....DID YOU? 36I needed clothes and you clothed me.....DID YOU? I was sick and you looked after me...DID YOU? I was in prison and you came to visit me......DID YOU? 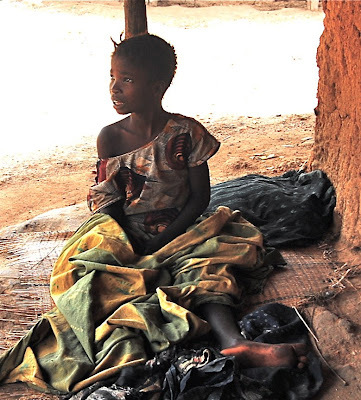 Children of all nations suffer from this quite often in their lives, but none so regularly as those living in poverty. 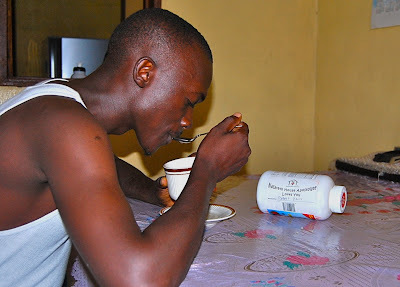 Poverty, where there is no "kleenex" ...where market places DO NOT make available to them fifty choices of tissues to wipe their noses (some even with lotion to prevent the discomforts of the well-wiped, but chapped nose). And even if it were available, it would be priced beyond the means of the normal Sierra Leonean. ....So the noses run, the germs spread, the cycle perpetuates. In America, a runny nose is an annoyance, quickly diverted by a tissue and an antihistamine. This is not the case in Sierra Leone, there is no diversion. This is the case for many of the poor, no diversions, no hope, no quick fixes. It is so hard for us in the West to imagine, a life so impoverished that less than a half of cup of rice a day is considered a luxury. But it is life in this West African Nation...it is the life of many...not a few, not some... but MANY. 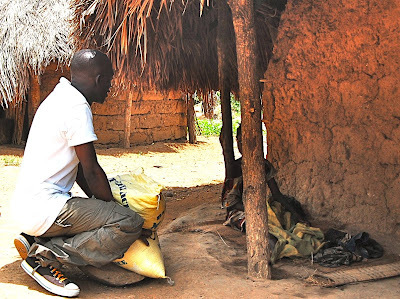 We all have excuses why we are unable to give to enable Nazareth House Apostolate to help to come to the aid of these our brothers and sisters in needs. "The recession is weighing heavy on us"; "I can't give enough to make a difference"; "I'll give when things are better for me"; etc. etc. Though they might be legitimate excuses, they keep us from doing the very thing our Lord requires - helping those less fortunate then ourselves. The world constantly tries to tell us what we can't do, but it is time to show the world what we CAN do. 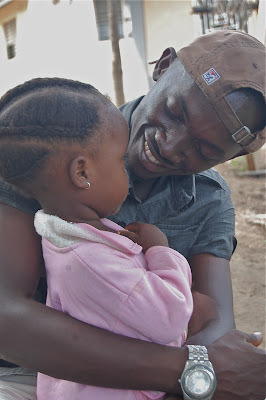 Even in the midst of a tumbling economy, let's make our love, our compassion RECESSION PROOF..., putting the needs of our suffering brethren before our wants and excesses.... give today. Most people do help others and a whole lot try to help when they see that it is necessary. Others need to be reminded to help, thinking first of their own wants. Sometimes it’s very difficult to do when there is nothing at hand to help with. This wonderful gift from God which we call love, most times gears us towards helping others even when we don’t have enough. Thoughts of this kept building in my head this morning as I drank a cup of coffee and ready to take my vitamin pill, a gift from a caring, loving late friend called Fr. Bob Haux. Tears ran my eyes knowing fully well that this man I had never met before cared so much for so many including me out here. This he did from afar stretching his loving and tender heart across the oceans to many that he never had the opportunity to meet. 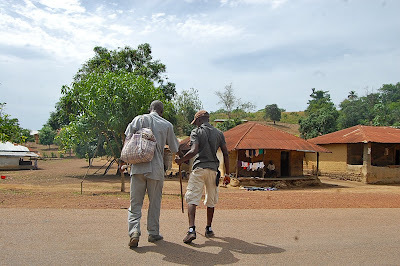 Tell me this is not love……..
An encounter with a blind poor man walking his way to his village along the Fadugu Kabala high way created a beautiful scene of friendship and love between us. Here this poor man was begging me to drop him off and he was ready to pay with his last leones which wont be enough for him to buy a piece of bread. This was the best opportunity for me to extend my own side of a loving hand, making him feel so happy at his stopping point. I felt so good doing this. 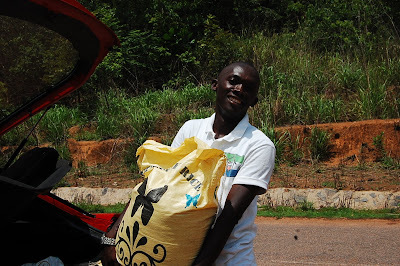 for James to make a trip to Kabala to check on the school and distribute rice to those in need along the way. 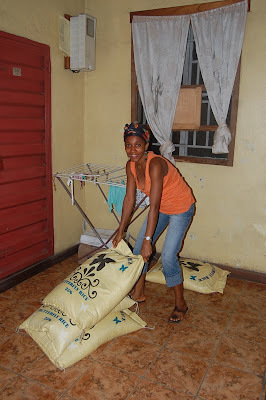 Its is our belief and wish at NHA to give rice for those who are in real hunger as (and when necessary). 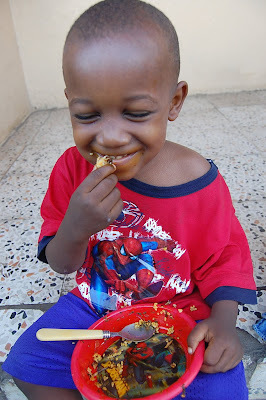 With the little funds we manage to scrape up every month, we pick families around us and those beyond to surprise them with a little bit of help to ease the hunger cry. 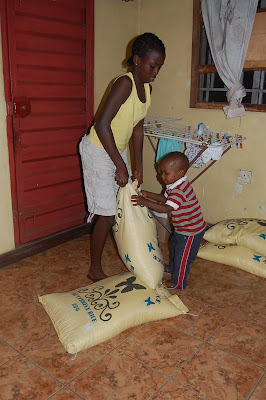 Small as he is, I need not tell ROO to help me collect, pack and give rice out to our neighbors. This is what we do and would love to continue doing since there a so much empty stomachs out there. with a handful of medical supply and rice reaching the most desperate homes especially those who had never had a bag from us before. and adults and they need not ask you to give them for their eyes and the way they do says it all. More and more kids left alone to baby sit themselves till 7:00 PM in the evening, when the family food will be ready. Sometimes you need not blame the parents for they too had no choice but to make use of the best harvest that are left behind by rats and monkeys’. As a child I had experienced this and till this day I still see mothers struggling to make the last days meal for their hungry kids who just sit back and wait for what will be placed in their big empty bowls. active the up coming days. There is this joy you always find in their eyes and with this, it is always in my mind to give out more and more everyday. A poor blind man could not believe that he was receiving a gift of rice and couldn't believe it was true. He asked if this will happen for him at least once every three month before he dies. 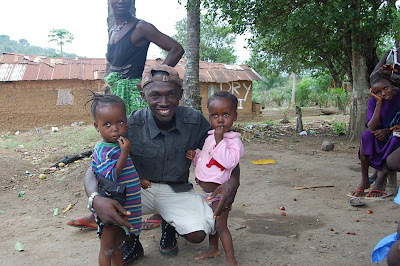 (Help me provide this for him - give today). For him death is just around the corner since he is blind and has no means of providing for himself. way we at NHA are trying to do. See the huge smile of appreciating in this one legged woman's eye as I dropped her her own gift from St. Laurence House. This is something no one will stop us from doing, we will continue despite the struggles. 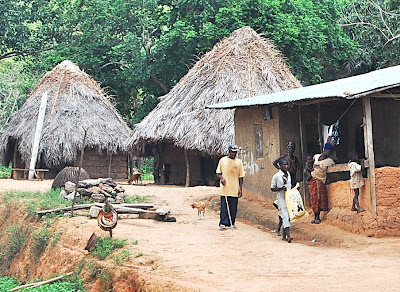 Together we will make our way into more and more hidden villages and do our work. A big thanks to you all helping us reach these people. It is because of your compassion that they can keep breathing, please keep it up. You are important and needed. 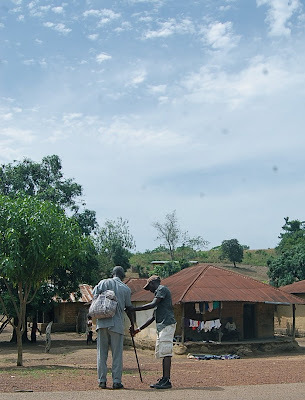 POST OFFICE: NHA deliveries here and abroad! 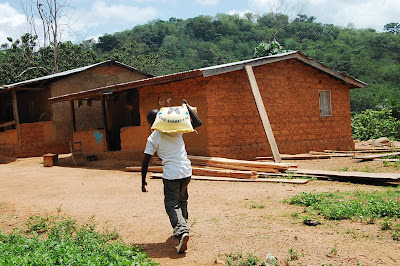 Mail is "functioning" again for Nazareth House both at our Office Headquarters in Louisville, KY and on the scene at St. Laurence House in Freetown, Sierra Leone. For several weeks, we received NO mail for Nazareth House Apostolate at our headquarters in Louisville. It seems the USPS here in town, decided on their own that Nazareth House "didn't exist" and returned our mail to the senders clearly marked "undeliverable at this address". We remain at the same address we've been at since 2001, but who knows why people do what they do? 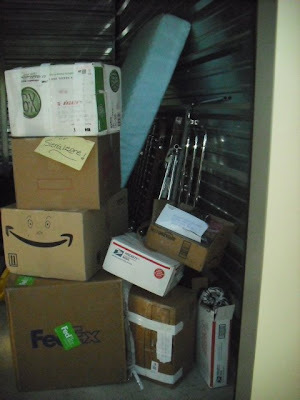 Anyway, after an inquiry at the Post Sorting Center, our mail is now be delivered. I was beginning to be very concerned by the lack of donations. Hopefully now they will recover. If you sent a donation and it was returned, it is safe to resend it now. We are sorry for the inconvenience, but please do send them as we have many needs to fill this month, many hungry, sick people. The USPS has our mail "on watch" to make sure it is delivered properly everyday! Good news! 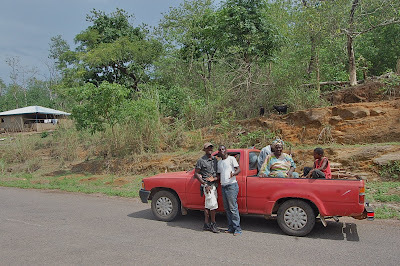 In other good news, The Post Office in Freetown functioned extremely well, also. A package sent on May 29th arrived in Freetown on June 4th - unopened, untouched, fully intact. Awesome. Liz Holt and Kathy Nagy from Louisville, sent a package filled with goodies for St. Laurence House. 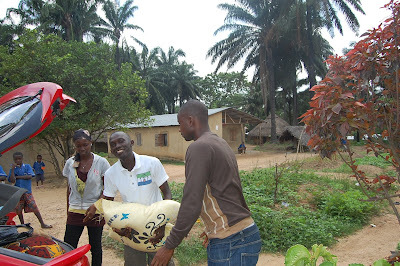 It was their way of showing your Nazareth House Staff in Sierra Leone how much they are appreciated. The package arrived just as we had packed it! Yippee! Pork 'n Beans, tuna fish, diarrhea medication, nose spray, Coffee and a special gift for James and Kadijah - a crank radio/flashlight/cell phone charger! When there is no electricity and no batteries they now have this handy item to charge their phones, light up their path and hear the news. James anxiously tries out the radio. 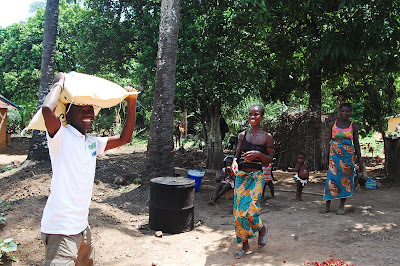 It is really exciting that these items made it there, intact, and I credit the Freetown Post for their efforts. Keep it up guys and thanks! Roo experiences the value of FREEDOM! If your week has been like ours, its had its share of frustration. Everyone has those weeks from time to time and they are good lessons in patience - at least this is what I keep telling myself (smile). The other morning was particularly annoying. For years I've fought with the Sierra Leone Post in order to get packages delivered without items stolen from within or whole boxes lost all together. But the USPS, I could count on...that is... until recently. I suddenly noticed a drop in donations and mail for Nazareth House at our address. This is always a scary thing to have happen since without our help people are put in severe need. Nazareth House Office Headquarters shares property with Grace Church in Louisville, but is incorporated separately. Both organizations are registered Kentucky Corporations at the Goldsmith Lane address. We've been getting mail for Nazareth House at that address since 2001. As of May 11, 2009, the USPS took it upon themselves to stick a yellow label on and return to sender all mail for Nazareth House. The label reading "undeliverable at this address"! I began to get calls from people who have had donations sent by mail returned. We went to the Louisville Post, showed them our Corporation Registration papers (we had to go to 3 different USPS offices to get to the right place) and explained the problem. They were at a loss and said they didn't understand why this was happening. They assured me they would get it fixed. 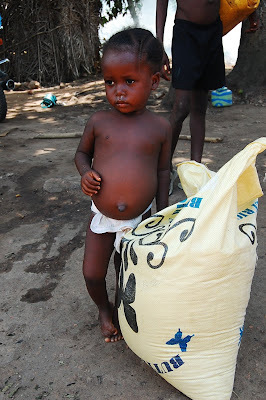 I explained that we are a humanitarian organization and that when donations don't come - people starve. There are very needy people depending on us to survive. This was Tuesday. Yesterday, I did receive a piece of mail for Nazareth House. I pray that this situation has been rectified. If you have received your donation returned, please resend it. 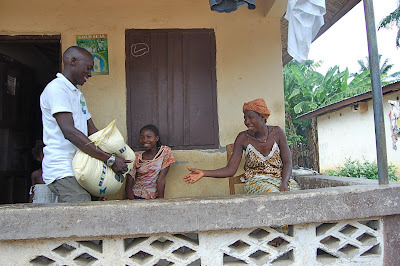 The economy has hurt us enough, we can't afford, for the sake of these dear people in Sierra Leone, to lose any more donations. If you were thinking of sending a donation and haven't yet - please do so today. The Post Office is on guard looking for our mail now and would like to have chance to make amends for their mistake. 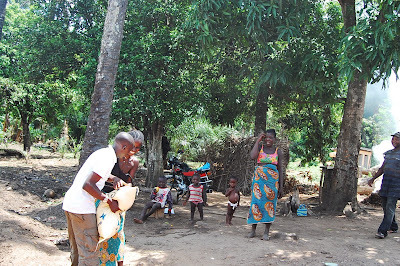 Let's bombard them with mail - let's keep them on their toes while we keep some bellies fed in Sierra Leone. Wow, We all pray success on our campaigns to raise awareness and funds for our work. We pray and place it in God's hand to work on. I am doing fine and woke up well. We were busy this morning figuring how to get ROO out who playfully locked himself in our Room. 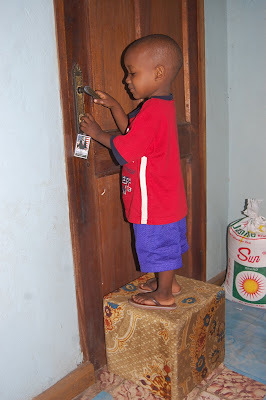 He locked it with the Key and could not open so i was looking around for him and I heard him inside saying Papa "Open the door for me". I said,"I cant for the key is inside with you". So he started crying and crying. 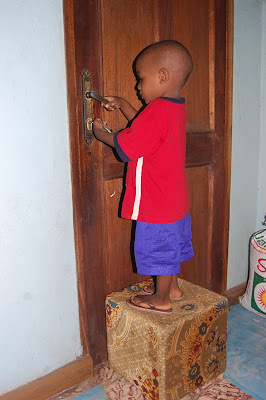 He was short and could not reach the key anymore. With my instructions from outside in the yard through the window, he placed a stool and climb up and them turned it a gain. It was a miracle. 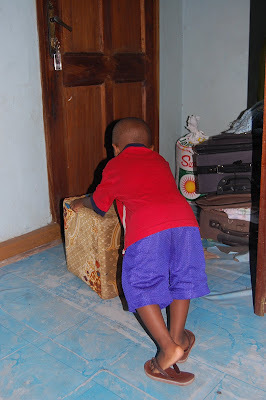 Since then he has refused to go into our room and now lodge himself in the prayer room. Funny but that could have cost us a whole door break. 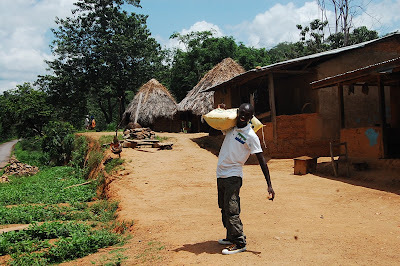 I am getting few items for school like chalk, papers, etc and preparing to deliver it to Kabala school soon. 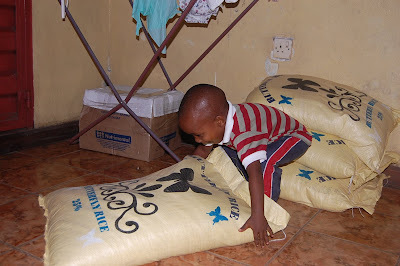 As I go, I will be doing rice bags for some poor families too. Pray and I will report on that too. I miss you but will catch you later on. As James gives instructions from outside the bedroom window, Roo pushes over a stool to stand on to reach the door. An intense look on his face and key in hand , he tries to unlock the door. A smile creeps across Roo's face as he realizes success! Roo, never wanting to experience being locked-up again, celebrates his freedom with a bowl of Cassava Leaf & Rice. PS: As you can see, Roo is a huge Spiderman Fan. Daily frustrations being worked out... I have some good news to report. More boxes are being delivered to Maria filled with shoes. Still a long way to go to reach our goal. 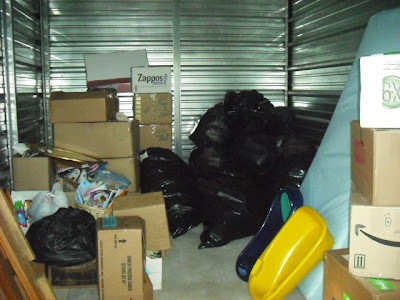 We are making progress filling this storage to later be packed into the container which will set sail to Sierra Leone. James also reports that another package has arrived to St. Laurence House from the Post. We'll report on that later. Thank you, God. It's all good.